1. All of the ingredients go into a small saucepan, heat over medium low heat and whisk to combine. Heat through till there are no lumps. Serve. 1. After you have cooked the noodles put them in a bowl big enough to mix in. Pour some of the sauce over the noodles and toss well to combine. 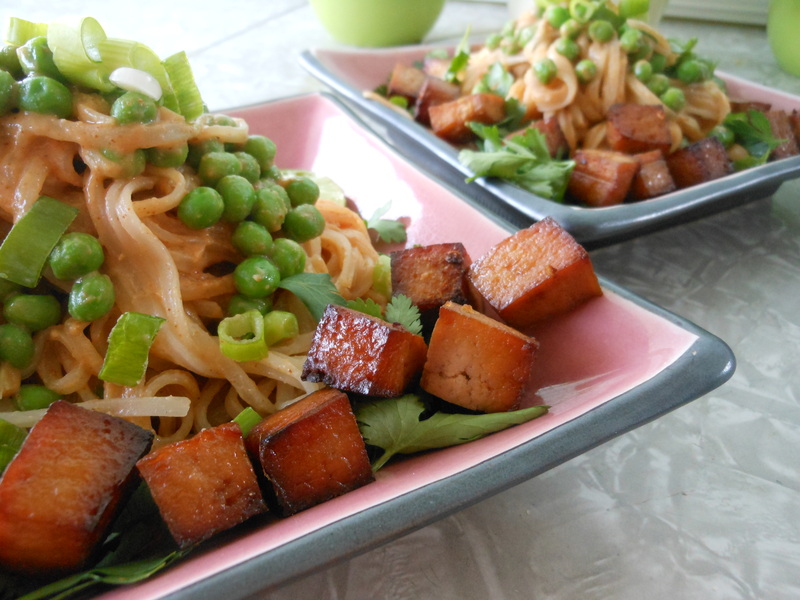 Divide between 2 bowls and garnish with the peas, crispy tofu, scallions, cilantro and a lime wedge. 1. All of the ingredients EXCEPT the tofu go into the food processor or blender. Blend until there are no chunks of garlic or ginger. 2. Cube the tofu, pour the sauce over the cubed tofu and marinate over night. 3. Bake at 375 for 20-25 minutes. Keep and eye on the tofu and turn a few times while cooking. You be the judge of how crispy you want your tofu. Eat as a snack or add to Pineapple Pad Thai, great in salad and stir-frys. Sometimes (healthy) comfort is the only nutrition we need! My sweetie loves Pad Thai w/Tofu! Sometimes after a long day I’ll call and say ‘wanna get Thai tonight?’ Billy is quick to oblige. This means noodle soup w/veggies for me, which is like a grown up version of Top Ramen, but on a whole other level with its spicy broth and chunks of garlic lingering in the bottom of the bowl. For Billy this means Pad Thai w/Tofu and a side of peanut sauce, he LOVES his peanut sauce! As we are both enjoying our slurpy noodles and pretending we are on some kind of exotic vacation (not!) it hits me that I SHOULD MAKE MY OWN PEANUT SAUCE for my sweetie- BRILLENT idea Brooke! To the kitchen I go. It took me a few attempts, all of which Mr. William didn’t mind testing, but this Pineapple Pad Thai was my favorite and I feel is ‘blog worthy’. It’s a goodie. Enjoy! Mmm even just the title alone makes me hungry! Thanks Elle, it is easy and super delish. Give it a try and let me know what you think. Thank you, that recipe was for my sweetie.